Another fun installment in the Crispin Guest series. This go round, Crispin is charged by the Archbishop of Canterbury to help find the bones of the sainted Thomas Becket, which had apparently been stolen in a heretical Lollard plot. Along the way, Crispin and Jack met up with Crispin’s old friend Geoffrey Chaucer (yay, Chaucer!) and several of the pilgrims from The Canterbury Tales. The Wife of Bath is much less abrasive in this tale than she is under Chaucer’s pen. She is, in fact, my favorite secondary character in this story, kind and steadfast. 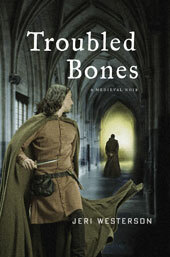 As well as missing saint’s bones are two murders, for which Chaucer gets himself accused, a bishop accused of extortion, a troubled young girl, and Jack, who suddenly finds himself on the cusp of puberty. Yayyy. Everyone’s favorite time of life. Overall, another terrific and well researched entry. I eagerly five into Blood Lance next! Should be dive. It was either a typo or auto correct since I was posting from my tablet.